The Oscar Buzz: "Moana" vs. "La La Land": Who Should Win Best Original Song? "Moana" vs. "La La Land": Who Should Win Best Original Song? While the Best Picture category may be the biggest award given out on Oscar Night, there's few other categories that could be as exciting as Best Original Song. This is because, unlike having to watch hours of movies, it's a category that distills the art form to a brief ditty. They are the indicator that most will have for these movies, and it's none more present than for soundtrack-turned-radio hits. This year has a phenomenal list (and Sting) to choose from, but there's probably only two that are neck and neck with each other: La La Land and Moana. Which film should win the category, and in the case of La La Land: which one of its songs? The following is a defense and exploration of each of the three songs likely to take home the top prize. Among the things that 2016 will be remembered for is that it revived the movie musical genre after years of stagnation. Between La La Land and Moana, the fall season was blistering with catchy tunes that accompanied some of the best that cinema had to offer. Even non-musicals like Sing Street and Popstar: Never Stop Never Stopping had ear worms that rose above the mediocrity of what generally passes for Best Original Song nominations. While this year isn't perfect, it did have an interesting narrative from the start. Would this be the year that Moana's Lin-Manuel Miranda achieved his EGOT, or would this be the year of La La Land with Justin Hurwitz getting a deserved win for arguably one of the best musicals of the short millennium. While I don't usually invest too much effort into this category, I have fallen in love with both of these films and have listened to the soundtracks extensively. I understand the subjectivity that comes with these two films. One is an upbeat family movie about cultural identity, and the other is an upbeat ode to the Golden Age of Hollywood. I would be lying if I said that I didn't have pleasure in sitting outside their theaters listening to their rich tapestry of music while I waited for my show to start. If I had more time, I would go into each soundtrack and explain why I favor Moana's music more, but like La La Land's story better. Instead, I will just start with the latest Disney princess movie. I am slightly disappointed that Moana didn't get a double nomination. I LOVE "Where You Are" and feel that it is a contemporary version of Beauty and the Beast's "Belle" both conceptually and in quality. However, there is an obviousness to "How Far I'll Go" getting nominated that may undermine its chances. It is the call to action song that every good Disney movie has. The only difference is that Miranda's lyricism and rhythms don't have the continuity of Frozen's "Let It Go." It would take kids a few listens to get the whole thing down. It's not a bad song on first listen, but what Moana's soundtrack has is a series of songs that become enriched with time. Even with this hindrance, it's a powerful song. Auli'i Cravalho's voice sings with power, and that chorus has probably the strongest energy in the category. There's also the lyricism, which shows complexity within a simple and repetitive pattern that captures the yearning to travel to sea and make a difference. This is the song of ambition and hope. It's one of Disney's best songs in quite a few years - at least since Tangled. Besides Trolls' "Can't Stop The Feeling," it is also the one most recognizable to those who haven't seen the movie. It's an all important tool to dominating this category, as I'm sure there's millions of people who hate "Let It Go" but only know what Frozen is. Besides it being just a great song, there's the other narrative that every other song doesn't have. This could be an EGOT win for Miranda, whose stature in the past few years has been phenomenal. He's only begun to show his post-Hamilton potential, and it's lovely. If he doesn't at least tie Alan Menken's song nominations by the end of his career, then we'll be worse off as a society. That of course is the one detriment that could go against him. He could win next time. Also, Moana may have raked in more money than La La Land, but the consensus around awards season is different. The film lost Best Original Song at the Golden Globes to La La Land, which may bode as a threat to its potential win. Though to be fair, the Golden Globes' track record with predicting The Oscars' Best Original Song category is extremely lousy. Then there is La La Land, whose double nomination isn't that surprising given its success during awards season. The only advantage that Moana has over La La Land that having double nominations may cause them to split the vote bad enough to get Miranda the award. It's a trick that defeated All About Eve when all four of its Best Actress and Best Supporting Actress nominees lost. Yet in the hypothetical situation, the popular rumor is that La La Land will dominate the night in ways not seen in years (I would say since Lord of the Rings: The Return of the King, but I don't see it winning 100%). Yet the question becomes which song will, for lack of better words, shine brightest. Let's be honest. "Audition (The Fools Who Dream)" is the better song. I still wish that "Another Day of Sun" or "Someone in the Crowd" made the cut instead of "City of Stars," but that will be discussed momentarily. For now I would like to explain why "Audition" should win. It's the centerpiece song. I found myself being reminded of the powerful finale in Cabaret as Emma Stone sang amid a blank backdrop about the foolishness of artists. It's so heartfelt, earnest, and raw. It captures the emotions of creativity and the pain of opening yourself up to everyone. Most of all, it comes at an emotional moment within the film that also reflects a turning point. While this is a category that should be based on how good a song is, the placement of it within a film is also key to its lasting impact, and I think that "Audition" has that staying power because of how Damien Chazelle directed the moment. It also helps that this may be the year of Emma Stone. I do believe that she is going to get Best Actress in spite of my hopes that Jackie's Natalie Portman would have. She just has the more memorable performance that balances happiness and sadness, desperation and freedom, and the exuberance of what the film wants to be. In fact, "Audition" is arguably one of the premiere scenes that will be featured on her reel when people look back on her career. She doesn't do much, yet her cadence empowers the vocals, hitting emotions that only work in song. It's a performance unto itself, and it's what I would put forward as why she deserves Best Actress. It also helps that it's just a powerful song that panders to Academy ideals of artists sacrificing their talents for unknown rewards. I'm sure it's a controversial opinion, but I think that "City of Stars" is one of La La Land's lesser songs. However, it's considered the front runners for the category. The only logical reasoning behind this is that it serves as a recurring motif, returning throughout the film to punctuate character growth and development. I don't even know which version of this song is being considered. Is it the stripped down version that Ryan Gosling sings, or is it the duet with Stone later on? Either way, it's a simple song that feels a little understated as a Best Original Song winner. In fact, both of La La Land's choices have more of a melancholic vibe than I'd usually associate with this category. Why not nominate something upbeat? With all of that said, I get why "City of Stars" is nominated. Theoretically it fits a similar ground to The Muppet Movie's "The Rainbow Connection." It isn't about elaborate production. It's about what is being sung. 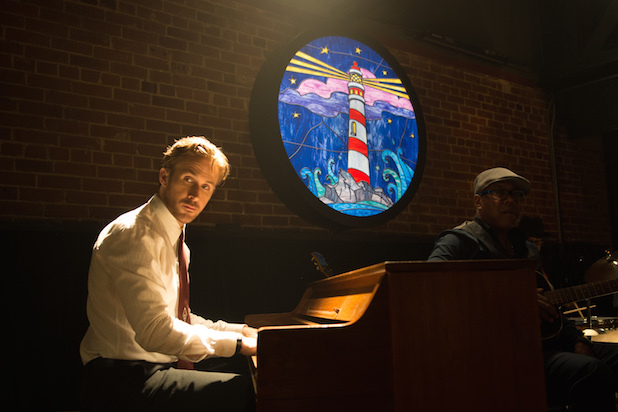 There is a longing in Gosling's singing that feels very familiar to artists everywhere. He wants to believe that his next potential dead end will actually lead to something wonderful. The uncertainty fills the music and makes the simple and recognizable piano riff (the one advantage over both other songs) get stuck in your head. Of course, it should be noted that Gosling's singing is far more understated and lacks the showiness of Stone. For an understated song, I don't get why it's the front runner. Which of the five Best Original Song nominees do you think will win? I really hope that "How Far I'll Go" is the surprise hit of the night, if just because I see it being a Disney classic in decades to come. It may lack immediacy, but it definitely sticks with the listener once it's accepted - I believe it also has the best craft of these nominees. Meanwhile, if La La Land has to win, I hope it's "Audition," because it feels eager and lively. Most of all, I'm just glad that musicals are being represented this year. The category could've been stronger, but the fact that it's a neck and neck race between the two films with the catchiest numbers, it's not a bad place to be.